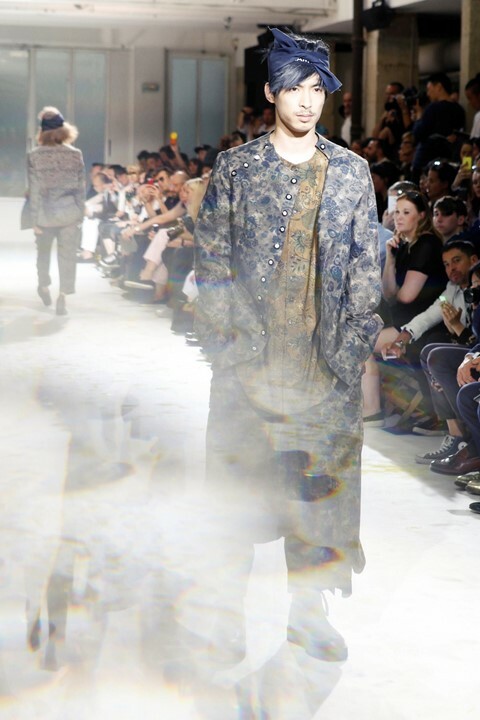 Traditional Oriental tapestry prints evolve into warped Texan tuxedos in Americana style double-denim, as models splash through unexplained puddles of yellow paint on the runway. The deconstructionist aesthetic pioneered by the designer in the mid-80s is still evidently coursing through his veins. Jackets were sliced in half, one-part sleeve and one-part holster, and bleached-through patches were stitched on to pinstriped blazers. Paisley printed scarves were knotted at the temple and white bandanas read ‘Los Angeles’, while square-end ties were barely legible with silver scrawlings. Dog-eared black and white imagery of Japanese ‘have you seen’ posters were tacked to the back of models – a bereaved owner’s cry for help as they search for missing puppies, kittens and loved ones. A gradual introduction led to full-blown denim-on-denim as swathes of the fabric staple were draped across shoulders like scarves, paired in different shades and buttoned up like Gakuran Tsume-eri (traditional Japanese school uniform jackets).